Last week I experimented with Ink-li-que, which is a technique where the quilt is first quilted and then colored with ink. There are a number of quilt artists who have carried this technique further and are using all kinds of paints to paint their quilts rather than use piecing or applique techniques. At the end of this post I will give you a couple of references where you can get further information if it is of interest to you. At least one major quilt show (Road to California) has recognized the need for a new competition category, and has added a category called “Painted Surface” to reflect this type of work and yet keep it separate from traditional quilting techniques. In my opinion this is an important distinction and I hope all quilt shows will adopt this new category. Now back to my modest attempt at Ink-li-que. As you can see in my gallery, I recently started experimenting with Zentangle drawings and enjoyed that process. Susan, a member of my guild, pointed out an article by Sherry Rogers-Harrison on Ink-li-que in American Quilter magazine from a couple of years ago. She commented that it looked like my zentangle work. I decided she was right and I should explore Ink-li-que a little to see if there were some different techniques I could apply to future zentangle quilts. 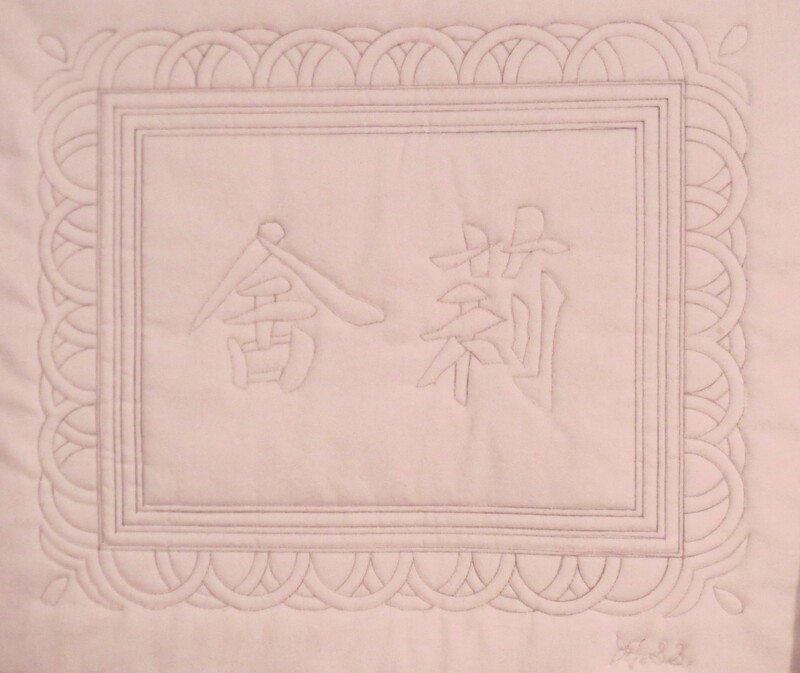 I designed a small quilt in black and white (the central chinese characters came from a book on Chinese calligraphy and are supposed to represent “Shirley”) . Following Sherry’s directions, I used a high thread count fabric (Pimatex) and pre treated it by spraying with Scotchgard and an art fixative. 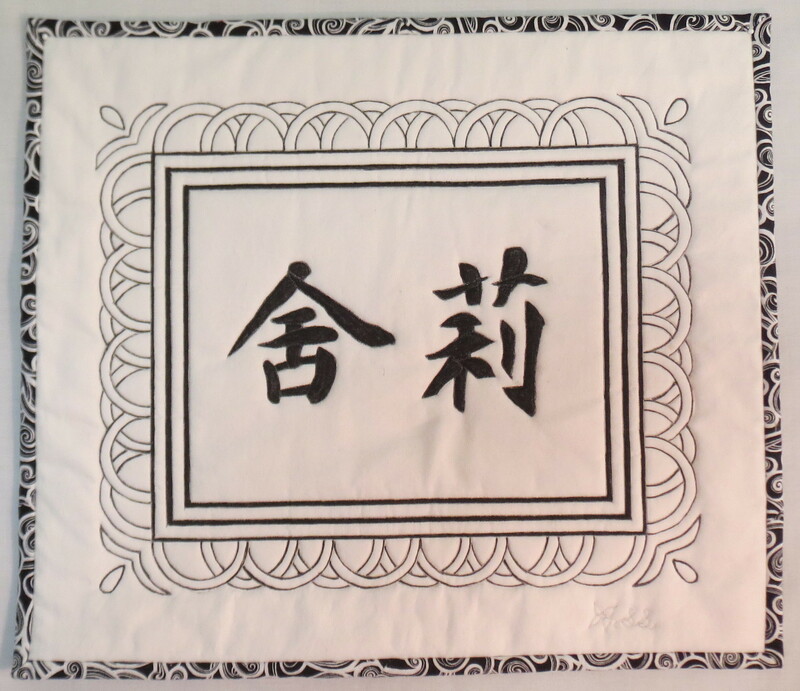 After letting the fabric dry – it was quite stiff – I drew the design on the fabric with a pencil. I sandwiched the quilt and stitched on the drawn lines with a fine white thread. I did some free motion but a lot of the stitching was done with a walking foot, since I knew the straight lines would come out straighter that way. Then I used a Gelly Roll pen to draw on top of the quilting threads, and used Pigma pens to fill in the large black areas. You can see the quilted but not inked version below with the inked version underneath. Although this came out OK, I think I would prefer it done more traditionally – using a heavy black thread and/or satin stitching for the lines, and with the characters done in regular applique. There is a flatness to the ink that doesn’t appeal to me for this formal a design. Interesting, since I don’t have the same reaction to the zentangle form, which I like a lot. There are many quilt artists who have carried this form to astonishing lengths and achieved beautiful results. Sherry Rogers-Harrison has some beautiful quilts at her website, www.sewfarsewgood.org . She also has made some you tube videos showing the techniques. Leah Day, another talented quilter, also has videos showing similar techniques. You can see these through her website, www.DayStyleDesigns.com . Or just do a search for either Sherry or Leah on youtube or with your favorite search engine. With use of rich metallic paints and clever highlighting, they can really make a quilt glow. This entry was posted in applique, Art Quilts, Quilting and tagged fabric painting, Ink-li-que, painted quilts on September 19, 2013 by Shirley at Mystery Bay Quilt Design.